Do You Trust the Future? Have you thought of YOUR answer? How would I answer that question? I have to trust the future. and God don’t make no mistakes! He served in office from 1989-1993. When I was introduced to the half-hour sitcom, I didn’t realize how much it would affect my view of problem-solving. I didn’t realize how much it would affect the world’s view of how to deal with trouble. There was a tidiness about those sitcoms. Usually they started out bright and cheery. Then a problem was introduced. The characters struggled with it. By the end of the half-hour, the issue was resolved and the world was rosy again. In real life, we came to expect those instant solutions. We stopped understanding the need to live through the hurts, the frustrations, the anger for more than a half an hour. More than a day. More than a month. Divorce rates sky-rocketed and continue to do so … except that today’s generation, having watched their parents’ marriages dissolve, is afraid of commitment. They just live together. To heck with marriage! The tidiness of the half-hour sitcoms was a farce. It did us no favor. Problems come. That’s a given. But they don’t go away in the blink of a TV show. They don’t go away with a magic wand. Or a twitch of “Bewitched” nose. They can not be solved without time, effort, patience, guidance, wisdom, and often forgiveness. They are better resolved with prayer. We need a Higher Force! Let the Holy Spirit in. Ask for help. Problem solving is not quick and tidy. It is a messy, time-consuming business! Don’t let the half-hour sitcom mentality deprive you of the joy and peace that comes from tenacity, persistence, forgiveness and the rewards of hangin’ in there! A friend sent me an e-mail with a collection of church marquees and billboard signs. This one caught my attention because my husband, Bob, and I had just spent a few days with dear, long-time friends who laughed with us as they shared a story of about an occasion when some mutual friends were “Stuck on Stupid.” Their story soon was overshadowed by the event that occurred around the next bend. Yup, that’s us! We were headed up a narrow, one-way mountain road. It was posted with a sign at the bottom that said, “Road Crew at Work.” My friend and I, sitting in the back seat, tried to convince our driver (my dear husband of 50+ years) NOT to go up that road. But did he and my friend’s husband listen to us? No, they took a vote. Bob and Jerry said, “Heck, the road crew has had time to fix the problem by now. This is a scenic route. Let’s go for it!” That was about 2:45 on a smokey Montana afternoon. Forest fires in Idaho were sending billows of smoke into our usually pristine, scenic valley. I was as anxious as they were to climb the Gravelley Range and get above the polluted level. But, not that way! 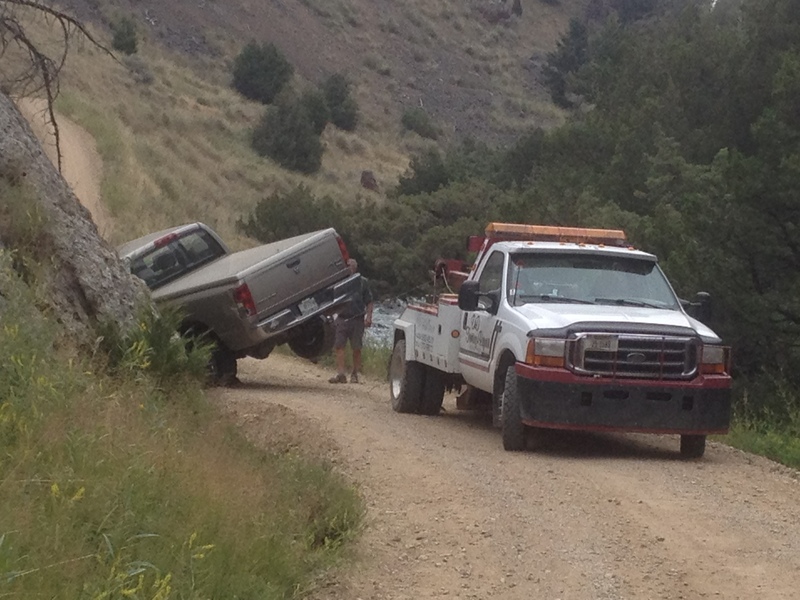 Sure enough, about two miles up the road, we encountered a Forest Service gravel truck coming down the road toward us. In that situation, someone has to give the right of way. Yup, it’s the one going uphill. So, we began to back down, looking for that wide spot where we might turn around – or tuck in to allow the truck to pass. The river was down a ravine to our right. The mountainside was to our left. Hug the left, of course. Don’t chance that drop into the river! A bend in the road – – – hug the hillside. Ooops! A slimy, slippery, black mud ditch on the left grabbed our truck tires and pulled it in. Clunk! The Forest service driver was assured that we needed his help – and we’d certainly not hold him liable if his efforts failed to get us out. He complied (dear man) and hooked up a chain, trying to pull us out. We ended up farther in the mud with the back of the truck jack-knifing into the hillside and the back fender and tail light crushed against a rock. Jerry and Carolyn’s story came back to me loud and clear. “Stuck on Stupid!” Yes, this was the perfect example. Our friends headed on foot down the mountainside to see if they could find help at the main road junction – about two and a half miles of rocks and dirt on a pretty steep decline. We were outside of cell phone coverage. A storm was brewing. 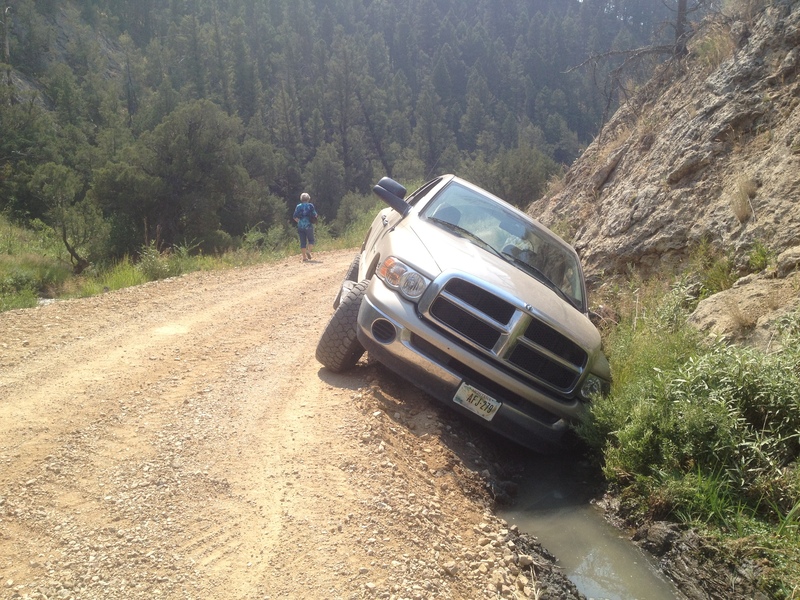 The driver of the gravel truck was able to reach his Forest Service headquarters on his radio system. They called the Forest Service in Ennis (our home town – more than an hour away). A call to the local auto repair and tow service sent them on their way to the rescue. It was after 5:00 PM by the time the tow truck arrived. Pulling us back in the direction from which we were already pulled was just going to bury us deeper. I couldn’t stand to watch! I prayed for divine guidance – for Bob and Paul, the driver of the tow truck. I prayed for safety for our friends who had walked down the mountain. I prayed for a miracle. I began to walk down the mountain, too, but the thunder and lightening sent me back to Bob and the stuck truck. As I rounded the corner, the scene startled me! The right rear tire was air-bound! That had to represent progress, right? More see-sawing back and forth for what seemed like hours. Bob encouraged Paul to connect the chain from the back of the truck rather than the one closer to the cab. Also, back the tow truck up closer and connect to the pick-up in a place that would allow the greatest angle. I held my breath for an eternity! Clunk! It bounced out almost as sharply as it had slid in! Nearly 6:00 PM by now. Lightening and thunder drawing nearer. We thanked Paul profusely as he dug muck out from the wheel wells and tire crevices to prevent brake damage. 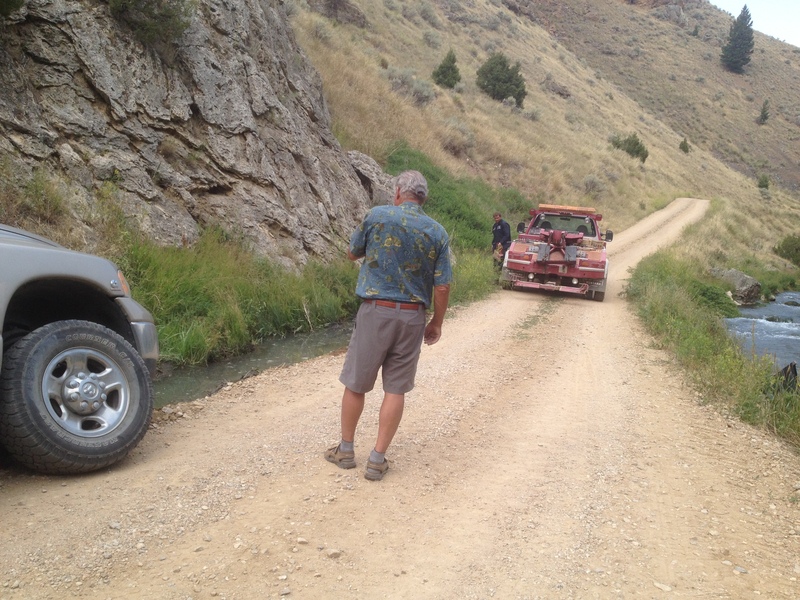 Then we followed the tow truck – down to find our guests. Just as the large Montana raindrops began to pound the windshield, we rescued them from the roadside. Our guys weren’t taking a vote on which direction to go from there. 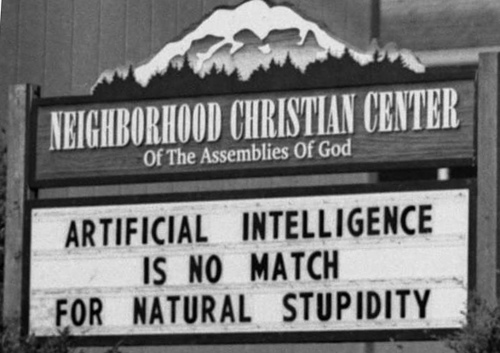 No artificial intelligence needed. We headed to the nearest restaurant with a bar. Three cheers for answered prayer, for Paul, for the Forest Service, and for being Unstuck on Stupid! If you’re on a one-way mountain road and the sign says “Road Crew at Work,” I don’t think you need a vote to decide to take another route. You’re not Stuck on Stupid!